Different versions of the Lockheed Martin F-35 Lightning II Joint Strike Fighter will be operated by the U.S. Air Force, the U.S. Navy and the U.S. Marine Corps. The short takeoff/vertical landing (STOVL) version is shown here hovering with its dorsal inlet open to provide air for the large downward-thrust-producing fan located in the fuselage and its engine exhaust nozzle pointed down to provide thrust vertically. The STOVL version of the F-35 will be operated by the U.S. Marine Corps and -- if the United States agrees to provide the United Kingdom with certain technological and maintenance information associated with the aircraft -- the Royal Air Force. As the paceof political and technological change intensifies, air power becomes ever moreimportant to the U.S. armed forces. This isclearly illustrated by the Iraq and Afghanistan conflicts. These guerilla wars havedriven rapid development and deployment of unmanned aerial vehicles (UAVs) for vitalsurveillance, threat-assessment and targeting tasks to make life less dangerousfor U.S. soldiers. UAVs areassuming great importance in the arsenal of aviation weapons that the U.S. forces can deploy and will become even more important in years to come. The first-everU.S. Air Force attack squadron composed entirely of UAVs will deploy later thisyear to Iraq, with MQ-9 Reapers. But,important as UAVs are becoming, U.S. forces will continue to need piloted aircraft.Transport, bomber, fighter and tanker aircraft will continue to be crewed for theconceivable future. So willhelicopters, though vertical-takeoff drones are now beginning to see use by the Navy and experiments continuewith a full-size unmanned helicopter for military use. Nobody is suggestingthere shouldn?t be flight crews on the new VH-71 United States Presidential helicoptersnow being built. The U.S.Navy plans to use the BoeingX-45C as an unmanned strike aircraft. But when, eventually, the Air Force seeksto augment its strategic bomber force -- the aircraft would enter service noearlier than 2018 -- it will probably want its new bomber to be optionallymanned. That is, theAir Force wants to be able to ensure human crews are onboard the aircraft forat least part of any mission, if necessary. There are argumentsfor and against operating unmanned fighter aircraft, said Wayne Plucker, senioraerospace and defense industry analyst for consulting firm Frost &Sullivan. One minusis that ?you?re not going to have a guy in the cockpit making decisions,? whocan react instantly to suddenly changing threats or mission priorities, saidPlucker. On the plusside, without the need to limit the aircraft?s performance capabilities to the G-forcelimits the human body can tolerate, it can be made more maneuverable. However,?with today?s weaponry, maneuver is not as critical as it once was," saidPlucker. "The ability to launch and control radar-guided and -- to alesser extent ? heat-seeking missiles at the right time is.? Severalimportant new aircraft types are entering service with the U.S. forces -- or soon will. Ultimately, unmanned versions of these aircraft probably willbe developed. But the aircraft were initially designed to have pilots and willbe flying manned for many years. Theyinclude the U.S. Marine Corps? and Air Force?s V-22 Osprey tilt-wing aircraft;the F-22A Raptor air superiority fighter; and the F-35 Lightning II Joint StrikeFighter (JSF), which will appear in three widely different versions. Designed asa strike aircraft with unprecedented ability to deliver precision-guidedground-attack munitions, the F-35 will initially be available as a conventional-takeoff-and-landingaircraft, to be operated in large numbers by the Air Force. Acarrier-borne version will be built for the Navy. 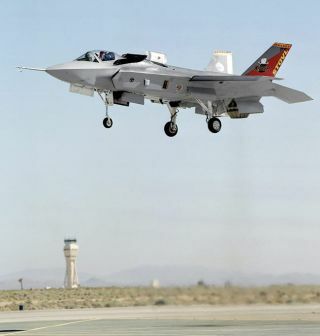 Additionally, a short-takeoffand vertical landing (STOVL) version will be built for the Marine Corps andprobably also for the Royal Air Force and other customers. The F-35will probably become one of the most-produced attack aircraft of the 21stcentury. In the foreseeable future it will replace the F-117 Nighthawk stealthfighter in U.S. Air Force service, because the aging F-117 is expensive tomaintain. But thetiming of the replacement depends on money. The huge expense of the Iraq war is making Congress think twice about approving large-scale future U.S. military aircraft programs, said Plucker. Already, inthis fiscal year, the U.S. Senate has removed some JSF funding from its versionof the defense appropriations bill. The House hasn?t, and the final bill will benegotiated in a conference committee; but resolution might not happen untilafter the 2008 fiscal year begins in October, said Plucker. Should thisprove the case, the appropriations hiatus ?will have effects? on the F-35program. ?There will be program delays," added Plucker. ?Realistically,I look for substantial downsizing within the next ... two years of research,development, test and evaluation (RDTE) programs. Some programs in RDTE will beprocured, but in limited quantities -- just enough to keep them in production,?said Plucker. ?Probably alot of money will be spent to repair and replace aircraft now in Iraq and not a lot will be spent beyond that,? he said. Some newprograms, inexpensive by the Department of Defense's budget standards, arewinning approval. The U.S. Army and Air Force recently placed a $2.04 billioncontract for 78 C-27J Spartan tactical cargo aircraft. The C-27J is an upgradedAeritalia G.222. Increasingly,however, in the absence of replacement types, the U.S. armed forces must relyon refurbishing existing aircraft. Offeringmuch-improved performance compared with earlier models, the CH-47F is thelatest version of the venerable Chinook transport helicopter. The Army ispurchasing some new, but the vast majority of its 400-plus CH-47Fs will berenovated CH-47Ds already in service. Similarly, theU.S. Air Force is refitting its C-5 Galaxy strategic airlifters with newavionics and more powerful engines and strengthening their structures to keepthe huge aircraft in service until mid-century.